Published in The Militant in the July 8, 2013 issue. The Militant is the official weekly newspaper of the Socialist Workers Party. 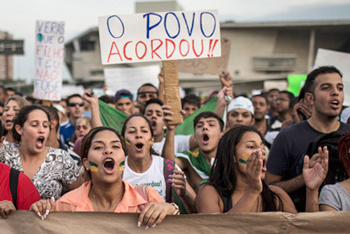 More than a million people across Brazil have taken to the streets, sparked by government bus fare hike. This entry was posted in Socialist/left parties and tagged brazil, protests, Socialist Workers Party, The Militant on June 30, 2013 by Krzysztof Lesiak. This entry was posted in Green Party and tagged brazil, Paulo Coelho on September 18, 2009 by paulie. This entry was posted in Green Party and tagged brazil on August 31, 2009 by paulie.